Awesome action figures from Star Wars: The Force Awakens and beyond! 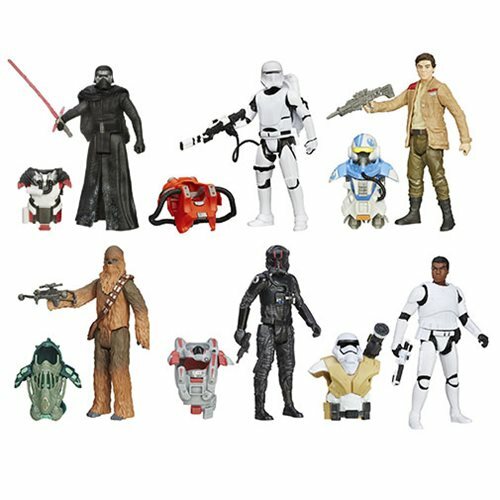 This box of Star Wars The Force Awakens Armor Series Action Figures includes 8 action figures with awesome accessories - including cool armor! Defend the galaxy - or destroy it - with the Star Wars The Force Awakens Armor Series Action Figures! Each 3 3/4-inch action figure includes a pair of accessories - or possibly even more - from a galaxy far, far away. Feel disturbances in the Force, and then defend yourself against them with this exquisite collection of action figures. Most action figures feature 5 joints each. Ages 4 and up.